This is an official replica banknote released by the Government of Gibraltar with a nominal legal tender value. The Government of Gibraltar has issued for the first time a replica Banknote for Gibraltar but unlike other replica Banknotes in the market, this specific Banknote was issued with a legal tender value redeemable in Gibraltar for the value of 50p during 2018. 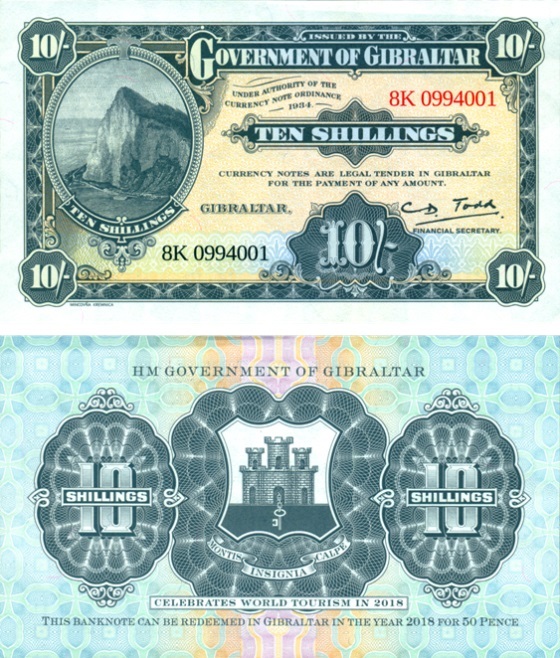 The Banknote was issued to celebrate World Tourism in 2018 and used the design of the official and iconic TEN SHILLING note from Gibraltar issued in 1934. Each replica banknote has a unique serial number. Although these can be considered a replica banknotes, it can be considered an official item due to the fact that the issuing authority is the Official Government of the country. A limited number of these notes have become available.